Boxwood Means | Is Conduit Lending Creeping Back? Is Conduit Lending Creeping Back? After three excruciatingly slow years, we may be seeing some encouraging developments on the small-balance conduit-lending front. When SmallBalance.com last asked Trepp LLC to compare delinquencies of securitized small-balance commercial mortgages to those of larger conduit loans 16 months or so ago, we reported a significantly lower distress rate for the smaller fare (6.54 percent vs. 9.18). 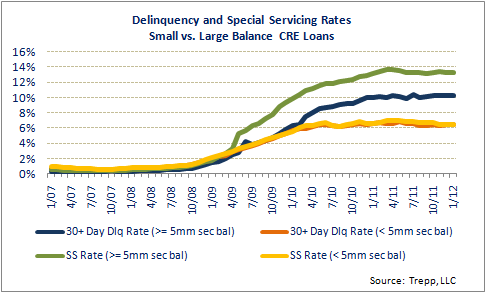 We recently asked Trepp to update those figures, and found that the gap between delinquencies of small-balance and larger CMBS loans has actually widened - with the small-balance 30-day rate now marginally lower (6.39 percent), and the $5 million-plus rate climbing into double-digit territory (10.21). The contrast in ratios of loans being handled by special servicers remains even more dramatic: 13.24 percent (on a principal-balance basis) with larger loans, compared to 6.46 for the small-balance set. Does this suggest small-balance borrowers will get more favorable treatment from conduit lenders as originations start to pick up from their long doldrums? That indeed seems to be a reasonable expectation - but only time will tell, given the still-depressed origination and securitization volumes we're seeing during 2012's first quarter. To wit Trepp's figures suggest new originations of small-balance loans for securitization have been few and far between since the analytics outfit provided its exclusive analysis in late-2010. The universe of outstanding small-balance conduit loans has actually shrunk even more than the larger-balance group. The small-cap balance is currently at about $55.25 billion - off 16.6 percent from more than $65 billion in October 2010. Meanwhile outstanding $5 million-plus conduit loans now total just under $510 billion - down 9.6 percent from the previous $564 billion. The shrinkage reflects how payoffs and other resolutions have outpaced the slack CMBS issuance pipeline. The marketplace was showing some encouraging signs of re-emergence during the first half of 2011 - until a combination of global and domestic economic and financial factors made conduit-loan quoting (and bond underwriting) quite the risky proposition. Although that volatility subsequently subsided - a reason for optimism - commercial mortgage securitizations amounted to a disappointing $30 billion last year. That was considerably better than 2010's paltry issuance, but still only about one-eighth of 2007's record volume. And predictably much of the activity over the past couple years has focused on low-risk, core-class collateral and the relatively strong multifamily sector - highlighted by the occasional single-asset, single-borrower and Freddie Mac deals. While scheduled first-quarter activity isn't particularly strong, several Wall Street stalwarts are actively looking to pool mortgages into pending bond issues. Along with a trio of scheduled single-asset transactions are a handful of billion-dollar conduit-category issues from the likes of underwriters Wells Fargo, JPMorgan, Morgan Stanley, Deutsche Bank, and UBS and RBS. Deal-tracker Real Capital Analytics is projecting issuance growth of roughly $50 billion for the full year (although other estimates have come in somewhat lower) - which, at the prevailing ratio, suggests at least $5 billion in bundled small-balance loans. Another reason for optimism: book-runners are once again offering senior CMBS classes in public bond offerings rather than the private placements seen almost exclusively over the past three years. And it certainly helps that in the wake of last summer's dislocation, we've seen something of a "resurgence" in investor demand, in turn prompting a re-compression of CMBS yields, observes mortgage banker and prolific blogger Steven Orchard with George Smith Partners. Indeed the DebtX loan-sale advisory outfit reports that investors now place greater value on commercial mortgages than they have for more than two years: an average of 86.1 percent of par at year-end, up from 79.4 percent a year earlier. The company cites today's negligible Treasury yields, narrowing credit spreads and recovering property-market fundamentals. "We've also seen a number of CMBS originators re-launch their previously mothballed platforms," Orchard relates. Also boding well for small-balance borrowers is the fact that some of the active conduits are once again considering collateral in secondary markets, and generally B-quality assets in B locations, Orchard also points out. They're likewise demonstrating more tolerance for single-tenant transactions - a major component of small-cap collateral - as well as properties facing lease-rollovers and generally more "hair" than has been the case for quite a while, he adds. And in fact the first conduit deal going to market this year - the $1.2 billion "2012-GC6" transaction underwritten by Goldman Sachs and Citigroup - pooled a smattering of small-balance loans. These include loans secured by 20 limited-service hotels, with average balances of $5.35 million; 10 conventional apartment loans averaging a bit over $400,000; a handful of smallish retail mortgages: shadow-anchored, unanchored and single-tenant; another handful secured by small-cap mixed-used properties; a couple secured by manufactured-housing parks averaging $5.32 million; and a parking garage loan carrying a $3 million balance. The weighted-average mortgage rate for the entire pool is 5.72 percent. In addition to Goldman and Citi, the pooled loans were originated by Archetype Mortgage Capital, KeyBank and Citadel Commercial Mortgage. But again even amid encouraging signs of a more liquid conduit arena, readers should keep in mind that a whole lot of five-year loans funded at the lofty cyclical peak are scheduled for maturity this year - suggesting more CMBS distress to come.